How far can I drive on a single Electric Vehicle charge? Distance is very important. But you will agree that even conventional cars have limited range too. The only difference which is an added advantage is the abundance of gas stations at specific distances to fuel up. Data indicate that 80 percent of normal drivers drive less than 60 km a day, which means that charging every night (or every few nights), will get us to work and back with a few errands in between (reference). So for distances above say 100 Km to -– we need some sort of charging infrastructure. The cruising range of an electric vehicle depends on a variety of factors, including the size of the battery, the model of the car, the road conditions, as well as the way the vehicle is driven. Poor weather, either extreme heat or cold, can cause battery performance to decrease, resulting in less mileage. Similarly, internal climate control mechanisms such as heating and air conditioning can drain the battery significantly and reduce the distance the car is able to travel between charges. However, these factors aside, average family-car size vehicles typically range about 100 km per charge. Back to the question on how far do EV’s go on a charge? The Ford Focus EV and the Nissan Leaf with bigger battery packs travel up to about 24KM on a single charge, while the Chevy Volt and the Mitsubishi i-MiEV travel lower KMs at 16KM due to smaller battery packs. The Tesla Roadster goes up to 380 kms on a charge while the Tesla Model S Motor Trend Car of the Year goes up to 480 kms. So on the Model S seven seater sedan, you can drive as far as from Toronto to Ottawa on a single charge. Plus it does 0-100 kms/hr in 3.9 seconds! Now a Chevy Volt has a total combined electric and gas range of over 550 kms so there are vehicles for almost every scenario and getting better every day. Sun Country Highway’s Via Motors / VTrux units however use Extended Range Electric Vehicle (EREV) technology -somewhat similar to a Chevy Volt. These vehicles get 60-65 kms of range in pure electric mode before the on board gas engine and generator kick in to replenish the battery pack and give you a combined electric and gas powered range of ~650 kms. And the best part is you get up to 100 mpg or 1.5lt/100 kms fuel economy. The important thing to think about is to purchase a vehicle that satisfies 98% of your driving needs. Many people say “but when I want to drive from Toronto to Quebec City what do I do, an EV can’t go that far”? True, a pure electric car may not be practical for very long trips, but how often does the average person take such trips, one, two or maybe three times per year? Within a year, one will be able to find Fast level II or Level III DC Quick Chargers almost everywhere! Electric cars can be found every where today, and show up in the news all the time. Electric Vehicles (EVs) originated in the mid-19th century as electricity had become the most popular method for motor vehicle propulsion. This provided a level of comfort and ease of operation that could not be achieved by the gasoline cars of the time (reference). 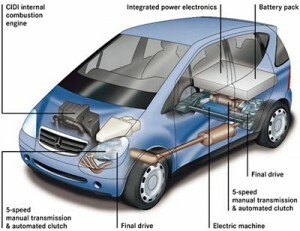 – The gasoline engine is replaced by an electric motor. – The electric motor gets its power from a controller. – The controller gets its power from an array of rechargeable batteries. The rechargeable battery provides electricity to the motor, which in turn controls the vehicle’s transmission. When the vehicle’s battery needs to be charged, it can be plugged into a standard household outlet (which may take up to 12 hours to charge depending on the outlet voltage), a specialized home charging system, or a public charge station connected to a community power grid. 1) By choosing to buy and EV, you save yourself a lot of money because we already know we can literally drive all the way across Canada for FREE and the cost to charge up is 1/8 that of fuel for a gas powered vehicle. So how much can you save in your local metropolitan area? 2) You helped save the environment and helped reduce healthcare costs! 3) Plus, you further helped sustain the economy on 2 levels – by employing an electrician and ensuring jobs for regional utility workers. Well think about not having to pump gas in the freezing cold and how nice it is to leave your house every day with a full charge. There is also no need to search for a gas station without a line-up on route to work in the morning. Our partnership with Sun Country Highway brings the World’s Longest/Greenest Highway Project to your doorstep. Sun Country Highway now has hundreds of chargers installed across Canada mainly on the Trans-Canada and 400 series Highways, with a goal to have over 1,000 chargers or more in place reaching out to 95% of Canadians. According to the Ontario Ministry of Transportation website, an electric vehicle (EV) is a vehicle that is powered by electricity and contains a battery to store energy. Electric vehicles use one or more electric motors or traction motors for propulsion. There are EVs that are directly powered from an external power station, others that are powered by stored electricity from an external power source, and those that are powered by an on-board electrical generator, such as an internal combustion engine (a hybrid electric vehicle) or a hydrogen fuel cell. 1. Conventional hybrid technology (HEV), in which the vehicle’s transmission is controlled by both a gasoline engine and fuel tank, and an electric motor and battery. All of the vehicle’s power comes from the gasoline. 2. Plug-in hybrid technology (PHEV), which relies primarily on a battery and electric drive train but is also supported by an internal combustion engine that recharges the battery when the power is low. 3. 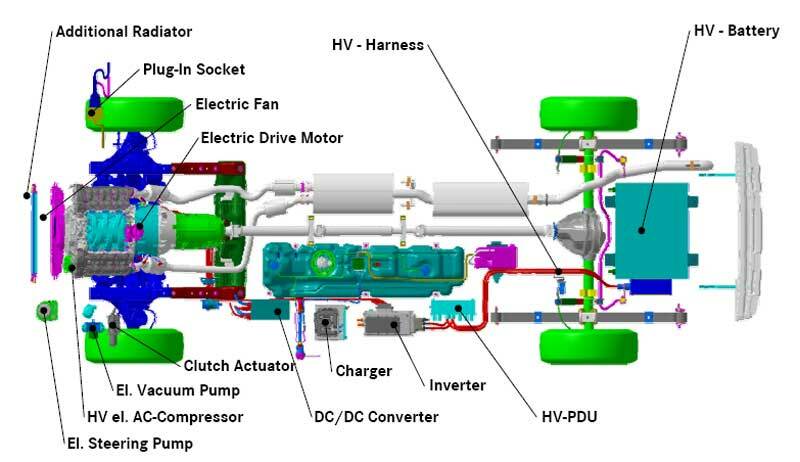 Battery electric technology (BEV), which operates entirely on a battery and electric drive train and requires regular charging from an external power source. Now think about this… Where does the energy come from to power an electric car? The electrical grid right! That means renewables like solar, wind, geothermal and other sources like hydro—even nuclear! As you may be aware, many parts of Canada (i.e. Ontario, Quebec and BC) are ‘flush’ with electric power at night – in the hours when there is minimal draw on our hydro-electric grids. Utilizing this ‘glut’ of available energy – which we are so often giving away to the USA to charge our EVs makes absolute perfect sense form an energy cost and strategy standpoint! All these are regionally produced sources of energy and this means jobs for your family, friends and neighbours. So there is no need to import fossil fuels from the Middle East or from Calgary. No need to import any carcinogens either! And you help ensure good jobs for engineers and power workers at your regional energy distribution company by driving an EV. 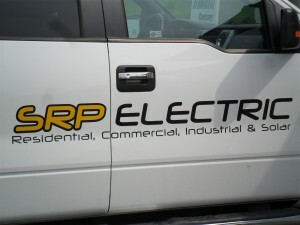 SRP Electric — Central Ontario’s choice for electrical contracting with over 20 years of electrical engineering and exceptional customer service has partnered with Sun Country Highway. This partnership aims to facilitate, and rapidly accelerate the adoption of electric vehicles and lower carbon emissions in the transportation sector here in Peterborough. This partnership also brings with it competitively priced advanced technology products to help drive sustainable revenues for local businesses. Its no secrete that Ontario’s electricity sources produce very low greenhouse gasses, and is also inexpensive. 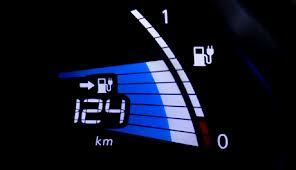 Data indicate that an electric vehicle can be charged at about 1/6th the price of gas at night during off-peak hours. We’ll discuss more on the efficiency and cost effectiveness of using electric vehicles in a later update, but note that no matter where you are in Canada, electric cars offer both environmental and economic benefits. The extent of these benefits will vary from one region to another depending on the sources of electricity generation and the local prices of gas and electricity.